Doncaster ended Yeovil's eight-match winning run with an improved display, but could not force a victory of their own against their promotion rivals. 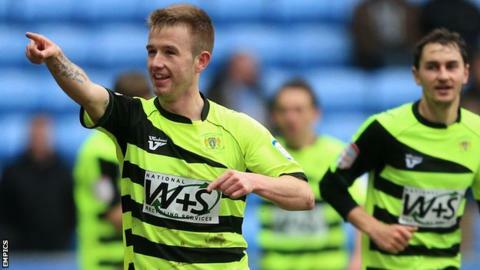 Paddy Madden's 11th goal in eight games gave Yeovil an early lead after keeper Gary Woods failed to hold a free-kick. Rovers levelled when Billy Paynter, who had hit the bar moments earlier, headed home a David Cotterill corner. Rob Jones later headed over from six yards and penalty appeals were rejected when David Syers went down in the box. Six minutes of injury time were necessary after Yeovil's James Hayter was carried off on a stretcher against his old club and, having been outplayed for long periods, a point was a good result for Gary Johnson's men. The draw kept them in fifth place in the League One table, two points behind new leaders Sheffield United, with Rovers, who have not won a single game this month, still a point better off despite dropping one place to fourth. "I was pleased with the performance, very pleased with the players both individually and collectively. "I was pleased for young John (Lundstram), I thought he came in and handled himself really well, one or two mistakes, but I was pleased overall. "I'm pleased for Billy (Paynter) to score after he missed his (earlier) chance. Paul Quinn was outstanding, I thought, so all round the revival has started. "It's three games undefeated, statistics are what you want them to be, but I'm very pleased (to draw) against a really good team."